Yes, I know, I’ve been doing quite a lot of dessert Friday Feasts. I do cook real meals! But, lately, I’ve been making so many yummy things for fun occasions, that I had to show you all the good sweets in my oven. When I was growing up, every Easter, we would have Gold Brick and Heavenly Hash Eggs from the local candy factory, Elmer’s. Oh they are so good. I didn’t realize that they were found only in the South, saturating the Louisiana market. I have a hard time finding Heavenly Hash Eggs in my neighborhood Publix. So, when I rediscovered this recipe for Heavenly Hash Brownies, I had to try them. And, wow, they are great. 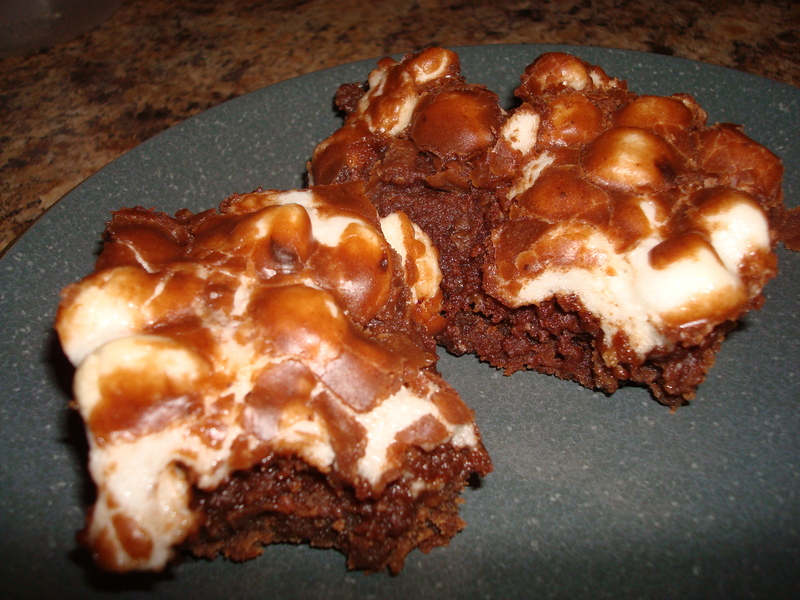 Yes, they are not exactly like the Elmer’s Eggs, but these are some wonderful brownies. Combine eggs, sugar, flour and vanilla. Melt margarine and add cocoa. Add to egg mix and beat well. Bake in 9×13 pan at 350 degrees for 25-30 minutes. As soon as the cake is taken from the oven, cover it with marshmallows and return to oven until marshmallows are slightly melted. Pour chocolate frosting over the top and cool before cutting. Combine margarine, milk and cocoa.